View of the Charles River looking towards the Longfellow Bridge and Cambridge. This is going to be my last post for awhile. I have to spend more time on a few other photo projects this summer, but plan to return in September. I wish you all a great summer of fun and photography. Really nice shot! Hope to see you soon. Have a nice Summer. love the black and white effect! You'll be missed..Enjoy your time and have a great summer too! Thank you to leave us with such a beautyful picture to dream about..
Wow talk about going out with a 'WHAM' shot, I get a lot of flack when I diverse into black and white occasionally, but for drama there is nothing like it, this shot with the boats and the bridge and everything really, is fabulous! Have a great summer and looking forward to being inspired when you return. You leave us with a big sky to sail our dreams in while we await your return. Wishing you success in your summer projects. 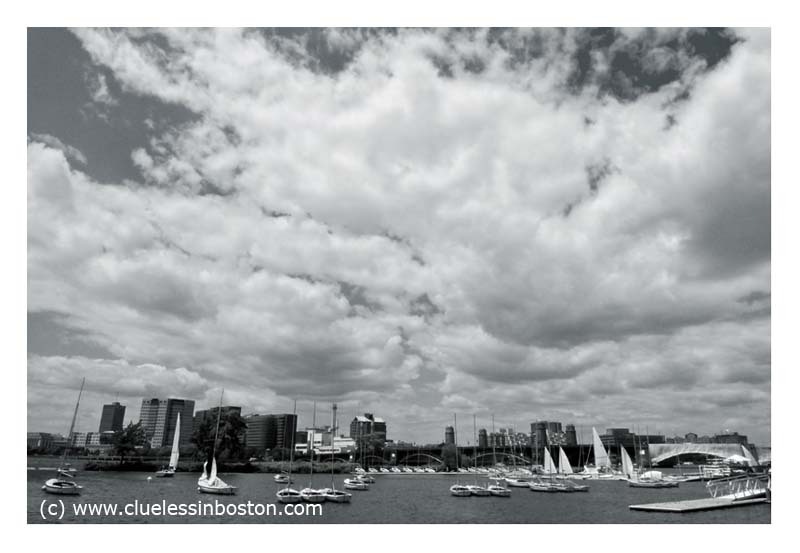 Lovely - all the clouds, boats and my favorite bridge. I can feel the breeze. perfect send off! Happy fourth and have a wonderful summer! Incredible sky and a great summer send-off... Enjoy your time and we will see you in September! Love this! It's so dramatic... wonderful capture. Have a great rest of the summer. Will miss your posts...will look forward to your return in September. totally going to miss your posts! have a picturesque summer...looking forward to your return in september! I will miss your posts. Please check on mine occasionally to keep me on track. Have a good summer. Oh dear! Have a lovely summer (but naturally, I'll miss you). It is strange, but I was thinking of taking a break too. Hmmm. Have a great summer. I shall miss your photos but we all need a break sometimes I think. You will come back refreshed. Keep this up and I'm going to start calling you Ansel Adams! Beautiful. The brooding clouds perfect the shot. We've been out-of-town but should be back to regular blogging soon. Have a great rest of the summer! Thank you for your comment and concern about the tragedy in Oslo this summer. I belive it was no easy weekend last weekend for you eighter, memoring 9/11.